Malbec’s story is a rags to riches story. An immigrant story. It is the story of a grape traveling from its homeland to the New World, getting a makeover, striking it rich, then heading back home with its spiffy new look. Except that it also never really left home in the first place. Malbec became popular as the juicy, spicy, rich wine from Argentina; however, its story goes much farther back. It originally comes from South West France, specifically from Cahors where it is has been grown since the thirteenth century. Here it is THE grape. You can find smatterings of it elsewhere in France–it’s one of the five red grapes of Bordeaux (although a fairly minor player) and you can also find a little bit out of the Loire, as well as a blending grape in other areas of the South West. That said Cahors is the only place in France where Malbec (also known as Côt) gets top billing–it must make up at least 70% of the blend, although it can be combined with Merlot and Tannat. 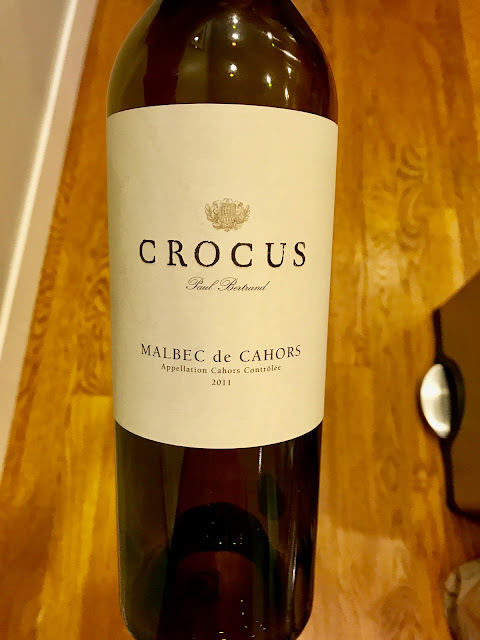 Malbec from Cahors tends to taste quite different from the super ripe versions from Argentina–it’s often more rustic, with more herbal and meaty/gamey notes. In a way, it’s not surprising that it had to move away from home to make a name for itself. Cahors is landlocked and the Bordelais, who historically controlled the nearest port of trade, would impose heavy taxes on wines from other nearby regions, keeping the little guys down. They were not, however, above blending the “black wines of Cahors” into their own BDX juice to ramp up the intensity. Now it is time for our hero-grape to return home; but of course it’s been there all along. Of course the winemakers of Cahors have been noticing the popularity Malbec from Argentina has been enjoying and they’ve been taking notes. Enter today’s wine–the Paul Bertrand Malbec Cahors Crocus 2011. It very much unites both threads in the Malbec story. The Paul Bertrand Crocus wines are a collaboration between Paul Hobbs (yup, same one) and Bertrand Vigouroux, whose family has been producing wine in the region since the last 1800’s (website says 1860’s, I have other materials that say 1887.) I actually got to hear about this project from both parties–I had the opportunity to have lunch with Bertrand Vigouroux and was later also invited to an industry seminar with Paul Hobbs. According to Vigouroux, his father’s estate had been celebrated before phylloxera decimated France’s vineyards, but they’d been left dormant for a longtime afterwards. His father wanted to bring them back and started replanting. 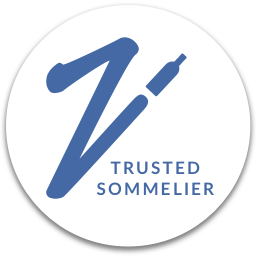 Fast forward a few years, Vigouroux arrives in the company after going to school to study enology and viticulture and is anxious to figure out what he can do to bring the wines into the next generation. He’s in the birthplace of Malbec and wanted to do his best to create a beautiful expression of the grape. He started traveling and eventually goes to Mendoza, where he was impressed by Paul Hobbs’ wines at Viña Cobos. He invited Hobbs to France and began working with him as a consultant on the family wines. Eventually the two men partnered up on the Crocus wines in 2010. Vigouroux told me that they chose the crocus as a symbol for the wines not only because the flower grows in the region, but also because in many ways it is a flower that goes against the grain. According to Vigouroux, it grows and blooms when other flowers are fading. It does its own thing. So let’s cue that makeover montage one more time. The Vigouroux family had excellent terroirs and Hobbs helped to update the winemaking practices with the goal of producing a more refined style of Cahors, without losing the powerful essence of the wines. They changed the size and selection of the barrels, modernized the sanitation practices, better controlled the handling of brettanomyces, updated the vineyard practices, and further restricted yields, among other things. All of this has paid off in the glass. I found an elegance in these wines distinct from a lot of the Cahors I’ve tasted in the past. It wasn’t Malbec from Argentina either. The wines still retained the character of Cahors, with herbal notes and a little meatiness. In addition though, there were pretty floral notes and while the fruit was rich, there was also plenty of freshness. 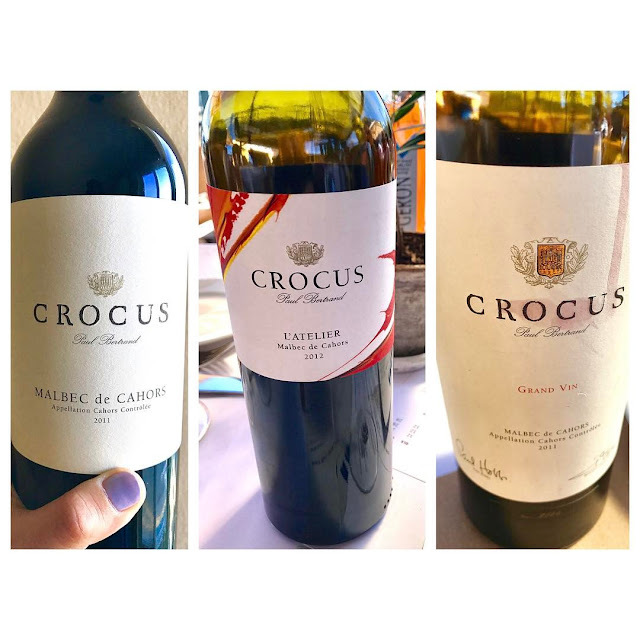 There are three tiers of Crocus wines. The entry-level wines are the L’Atelier line, the Prestige line in the middle, and the top end is the Grand Vin–to which I believe I responded “Wow” upon tasting. Today’s wine is the 2011 from the Prestige line, which happened to be the U.S. debut vintage. 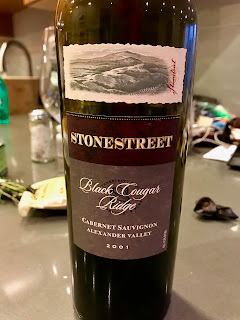 I’ve now had the chance to taste this wine a few times, but on the day I set out to cook to it, it showed lots of fresh blackberries along with some raspberries and plums, spices, tobacco, and a touch of game. It was also showing potpourri of lilacs and roses with some brambly and cedar notes. Greg added that there was a little black tea with a nice balance of smoke and brightness. The tannins were ripe and fine with plenty acidity on the mid-palate carrying through to a rich finish. This wine could certainly stand up to a rich dish, and we definitely wanted something meaty–but it was the middle of the summer, so we didn't feel like anything heavy or complicated.I also thought it more interesting to play to the more elegant notes in the wine, since that’s really what set it apart in my mind. Moreover, on the day I had lunch with Vigouroux, I’d had some lighter dishes, as well as some with green and herbal notes, and the wine did quite well with both. Top: Duck rillette with membrillo jam, pickled vegetables. Bottom: Spring pea tartine with burrata, hazelnuts, pea shoots, and country bread, bot at Angele Restaurant & Bar. 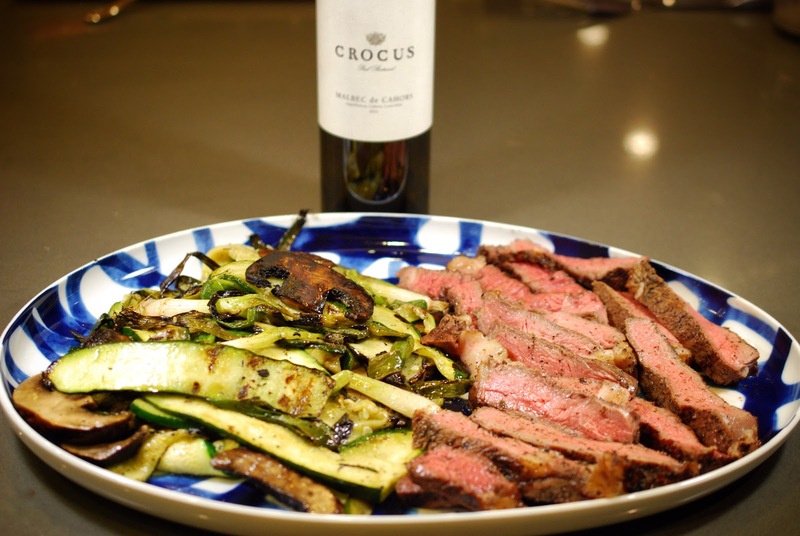 We also thought we’d take advantage of the summer grilling season and decided to go with a grilled steak with a simple rub incorporating flavors we found in the wine. I decided to use lavender to play up the floral note, along with thyme and black pepper. Greg thought to incorporate the tea as well. We found a beautiful ribeye steak at the store and decided to splurge. I decided to use our Anova Culinary Precision Circulator to cook the steak sous vide. We love this thing–it takes all the guesswork out cooking meat and makes it all effortless and delicious. We then finished it on the grill to get that beautiful char. Of course, you can also prepare the steak via traditional methods on the grill–I include directions for both. We chose some vegetables to grill alongside–Portobello mushrooms, zucchini, and green onions–, which I dressed simply with olive oil and lemon. I also decided to call back the lavender and mixed it with some lemon zest in a quick flavored salt. We were actually having dinner at my brother-in-law and sister-in-law’s house, and I happened to know that my sister-in-law was making a lentil salad. It was the perfect addition. You can find the recipe she used here. All of the components worked beautifully together. As we hoped, the seasoning really brought out the beautiful, feminine floral and herbal notes in the wine. It actually tasted lighter and more elegant alongside the food. The fact that it was all pretty easy and low-stress made for a perfect summer dinner. I feel like we’ve covered a lot of geeky tidbits today, but here are just a few more details on the wine. - Vines are dry-farmed (relying on annual natural rainfall, rather than irrigation) and uses lutte raisonnée techniques (the literal translation is “reasoned struggle” and it is a system of sustainable agriculture where the grower avoids chemical treatments unless absolutely necessary). - The wine spends 18 months in 50% new, 50% single use French oak barrels. You can find even more details here. Wine Searcher currently has the average price on this wine at $36, making this an attainable indulgence. My brother-in-law Dave is also a wine geek and both he and my sister-in-law Julia appreciate a good feast as much as we do, so we tend to go all-out when we get together. 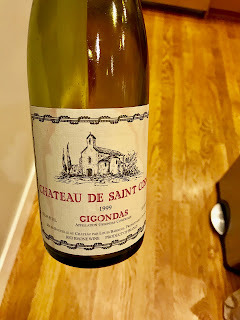 In addition to the Crocus, we also tried an aged Sonoma Cab (2001 Stonestreet Black Cougar Ridge Cabernet Sauvignon Alexander Valley) and a Gigondas (1999 Chateau de Saint Cosme Gigondas). 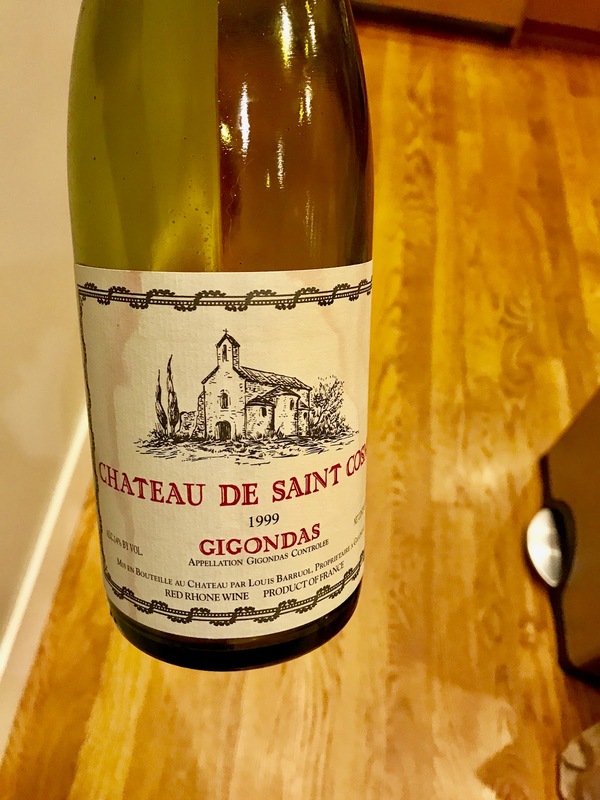 They both went really well–particularly the Gigondas given that it has some similar notes–but as a pairing, I must say the Cahors was my favorite even if I am touting my own horn. As far as other food options to have with the wine, Vigouroux told me that typical local pairings for Cahors wines include boar, lamb, and truffles. Saffron threads are also actually the stigmas of a particular crocus flower. All of these could be sources of inspiration for more Cahors pairings. 1. Set up sous vide immersion circulator and preheat water to desired final cooking temperature–129°F for medium-rare. 2. Combine the salt, lavender, thyme leaves, the contents of the tea bags, and black pepper. Rub a generous amount the salt-herb mixture on the steak. 3. Place the steak(s) in heavy-duty plastic bags and seal using a vacuum sealer or via the water displacement method if using a ziplock freezer bag. 4. Cook the steak in the water bath for one hour. 5. While the steak is cooking, preheat the grill to high heat. 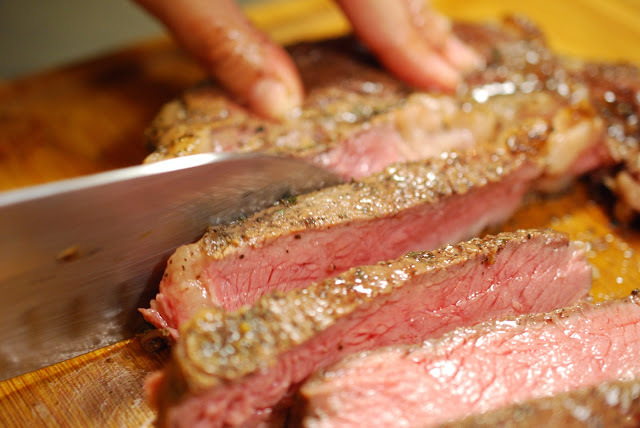 Once the steaks are cooked and pat dry with paper towels, then coat steaks lightly with a little cooking oil. (Make sure to save the juices left in the bag.) 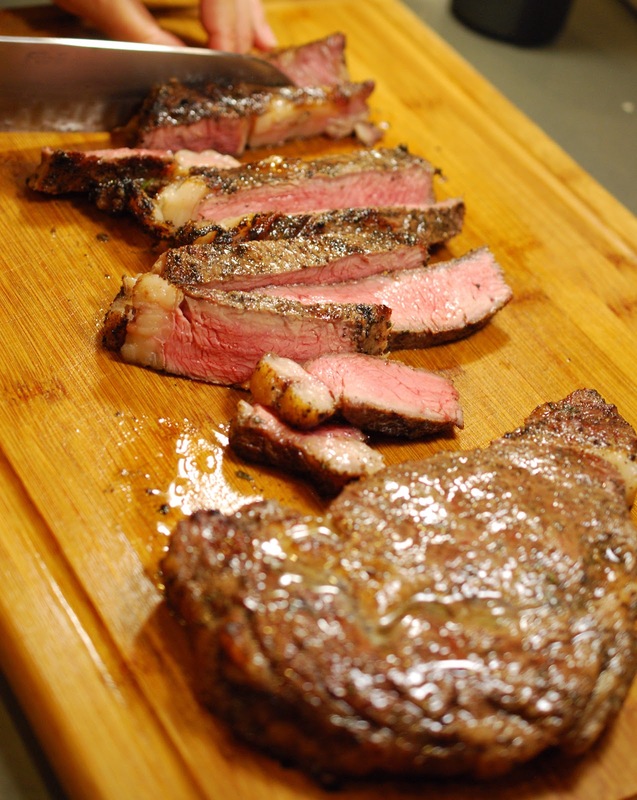 Finish the steaks by grilling for 1 to 2 minutes per side or just until nicely seared. Note: Alternatively, you can finish the steaks in a hot cast iron pan if cooking indoors. 6. Top the steak with a little pat of butter to finish, slice, and serve with steaks cooking juices. 3. Transfer the seasoned steaks to the grill and cook for 4 to 6 minutes per side for medium-rare, or until internal read thermometer reaches 130°-135°F. 4. Remove the steaks from grill, top with a little pat of butter, and allow resting for 5 to 10 minutes. Slice and serve. 2. Mix together salt, lemon zest, and lavender to taste. 3. Toss veggies with olive oil, a squeeze of lemon juice, and salt mixture. 4. 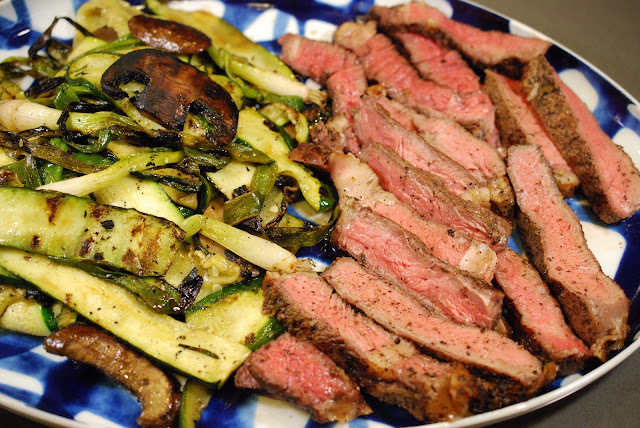 Place the zucchini and the Portobello slices on a vegetable grilling mat or on foil shaped into a tray and for 8 to 10 minutes, stirring occasionally, or until cooked through. Cook green onions directly on the grill until nicely seared. 5. Remove veggies from grill, season to taste with more salt mixture if desired and serve. As this fortuitously happens to be a French Wine, I'll also go ahead and wish everyone a happy Bastille Day! For another pairing from South West France pairing, check out 8 & $20: Pistachio-Crusted Rack of Lamb With Pomegranate-Mint Bulgur Wheat paired with a Madiran. Also, this month I'm participating in a discussion with the French Winophiles for the second time. If you're interested in finding out more about the wines of South West France, take a look at all the discoveries made by our Winophiles group! Really interesting post - I actually didn't know most of of those details about Cahors and Malbec so thanks for the history lesson! Loved the geeky details and your food pairings sound exquisite! Though it's a different price point than some of the other Wineophile finds, I agree that $36 makes it an indulgence but most definitely an affordable one! Thanks so much! And yes, even if a little pricier, I thought it interesting to explore a wine that's in the current evolution of the area–especially since I'd had a chance to talk to the winemakers! I'm glad Hobbs convinced Catena not to abandon Malbec- visited Catena in Mendoza and fell in love with his Malbec! Not being familiar with Bertrand, thanks for your in depth discussion about his and the other Malbec. Thoroughly loving these #winophile lessons. BTW- that Pea & Burrata Tartine-Yes! as does your grilled ribeye. Does Greg hire out?!? Catena was one of my favorite spots in Mendoza too -- so definitely with you there! And yes that Tartine was delicious -- certainly would recommend that spot if you find yourself in downtown Napa. (I actually shot that one ;-) ) And so far I have Greg's photo skills on demand and all to myself :-). I loved all your geeky tidbits and I was excited that it was about a varietal with which I am familiar. I didn't realize Malbec was one of the wines from this region. What a bunch of great looking dishes! I had no idea Paul Hobbs was involved in the Cahors. His Argentine Malbec is just about the only one I like, fascinating story! He does make some really beautiful wines! Cheers! Sounds like a perfect summer supper - I absolutely love the rub you made for the steak! Incorporating the lavender and black tea is ingenious, what a great match for the wine. Your notes on the wine made me want to sample it as well - mixing the best of old world and new - can't wait to try it!